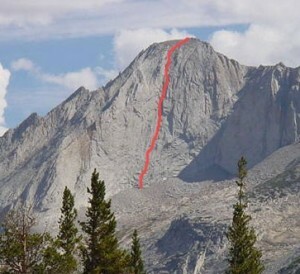 The sheer 1,200-foot white Southwest Face is the most prominent and alluring face in the Tuolumne area. If you climb 5.10 and you see it enough times (and you will since it is visible from Half Dome, Cathedral Peak, and anywhere in between), you will eventually need to climb it. Standing at the base, the route looks impressive and intimidating with a big roof and steep corner looming midway up. Stout, wild, and exposed climbing is mixed in with lower angle terrain. You must be in good offwidth shape for the sustained 5.10 wide pitch. The offwidth makes this climb just a touch harder than the Incredible Hulk's Red Dihedral.